Build a diverse committee and ensure that all members understand the committee’s role in the search process. Build rapport committee among members by creating an environment of collegiality, respect, dedication, and open-mindedness. Ensure that all members play meaningful roles in the process. Establish expectations and ground rules for such items as attendance, active involvement, decision-making, confidentiality, treatment of candi-dates, and more. Air views about diversity, discuss ideas about excellence, and develop a shared understanding of what diversity and excellence mean for a par-ticular search. Recruit a diverse applicant pool by searching broadly and inclusively. Save sifting and winnowing for later. Recruit aggressively by making personal contact with potential applicants, advertising in publications targeted to underrepresented groups, and communicating with organizations and people who can refer you to po-tential applicants. Learn about research on unconscious or implicit biases an assumptions and their influence on your evaluation of applicants. Question the objectivity of your own judgements and learn about other ways to mitigate bias. Implement policies and practices that can reduce the influence of unconscious or implicit bias. Ensure that every candidate interviewed – whether hired or not – is re-spected and treated well before, during, and after interviews and visits. Maintain communication with your final candidates until an offer is accepted. Fine, Eve, and Jo Handelsman. 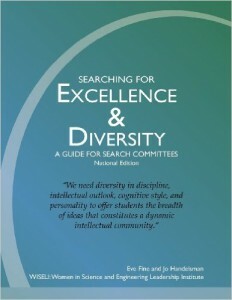 Searching for excellence & diversity: A guide for search committeesWISELI, 2012. © 2014 大阪市立大学女性研究者支援室. All Rights Reserved.